POSTED January 30, 2019 12:03 p.m.
VIOLA - I can’t help but smile, when I think of the number of times a reader has sidled up to me at the co-op or the post office to ask about Louisa. 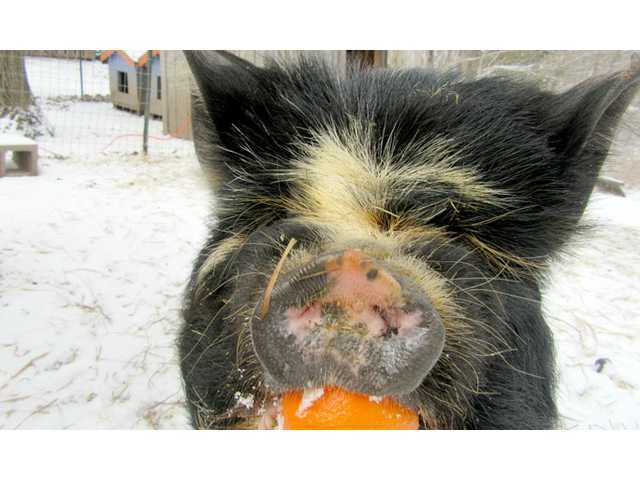 Louisa, my pet pig, was diagnosed with congestive heart failure last February. It’s good to know people care. She even received a get-well card in the mail. I shared the news of Louisa’s illness with the first person I saw that morning. They responded by reminding me that Louisa was just a pig. For the rest of my workday, I kept my troubles to myself. I’ve learned that there are animal people and non-animal people. I’ve observed for years the impact I have on some as I’ve recounted my woes about a duck with bumble-foot, a donkey with a hoof fungus, or Louisa’s congestive heart failure. I’ve watched eyes roll up inside foreheads and not come down until I’ve finished telling my sad tales. But, I’ve also noticed that sharing my grief over the sudden death of a dear neighbor could elicit the same reaction. Some people have enormous reserves of empathy for all humans. Other people seem to have a better understanding of how it feels to lose a beloved dog. And then there are some people who only care about themselves and no one else, whether four-legged, feathered, or two-legged. I know my animals have empathy for each other. Over the years, I’ve watched my dog Tete mourn the death of her best buddy, Raime. I’ve watched my cats search for days when their fellow cat, Farley, came up missing. And I remember how Benny, my parakeet, would not sing or talk after Joon fell from her perch and never got up.